MainAll NewsDefense/SecurityLaser Beams to Intercept Mortar Shells? Laser Beams to Intercept Mortar Shells? Following success of Iron Dome against rockets, system in the works to neutralize mortar fire cheaply and effectively. Mortar shells are less powerful than Katyusha rockets, but have been lethally used against Israel by terrorists in Gaza and Lebanon during the Second Lebanon War and Operation Protective Edge. Both Boeing and Israel's Rafael Advanced Defense Systems, Ltd. (Israel's second largest defense company) are working on laser defense systems against this threat. IsraelDefense reports that Rafael's system is known as Iron Beam, and could become operational within five years. Boeing, too, is working on a system, called "High Energy Laser Mobile Demonstrator", which could be ready by mid-to-late 2017. 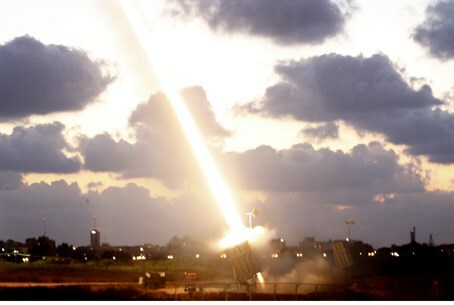 Israel's Iron Dome missile defense system cannot be used against the hundreds or thousands of mortar shells expected to be fired during a war, for economic and logistical reasons. A laser-based solution, however, would be effective, reasonably-priced, and would enable forces to maneuver with minimum risk. Peggy Morse, VP of Boeing's Directed Energy & Strategic Systems, told IsraelDefense that her company's system is "only a prototype at the moment, but we can present an operational system within two years. The advantage of this system is the cost/interception ratio compared to the use of interceptors. It can produce 150-200 shots between two cooling cycles, and thousands of shots in a 24-hour timeframe." She estimated that 50 such systems would be needed to provide protection against mortar fire along the entire perimeter of the Gaza Strip, and that they could be built within five years. Cooperation with Rafael was being considered, she said, but is not practical at present because both companies are in fact working on similar systems. "At the same time, we can think about integrating our system with [Israel's] Iron Dome system," she noted. Laser systems have their limitations, of course. They do not work perfectly in inclement weather conditions, and friendly vehicles in the vicinity are susceptible to damage when the system is in operation. From a technical standpoint, the output rate of the laser beams must be increased more than three-fold, to 100 kilowatts, in order to shorten the interception process to the recommended half-second duration. Relatively little is known about Rafael's system. The Ministry of Defense would say only, "At present, no operational laser interception system is available anywhere in the world (including the USA). If [Boeing] had a mature operational system ready for immediate deployment, the acquisition of such systems by the IDF could be considered in principle…"